Last Monday we headed north west past the acres of canal-side polytunnels at Whittington, then on to Huddlesford, the tranquility slightly marred by Virgin trains thundering past on the West Coast Main Line little more than a hundred feet away. The gardens of Whittington’s canal-side properties were a joy after the industrial squalor of Birmingham. 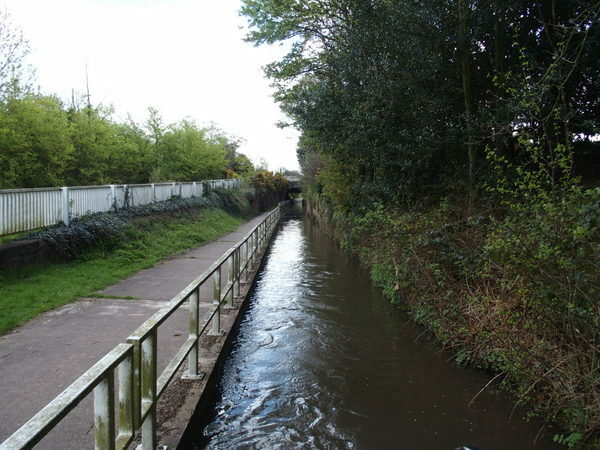 The canal ducked under the railway next to The Plough in Huddlesford where a rambler in a wide brimmed leather hat raised his steaming plastic flask cup in salute. Around the next bend we were held up briefly behind a red and green narrowboat zigzagging from bank to bank, cruising so slowly that I had to reverse half a dozen times to stop myself running into him. After half a mile he crashed into the towpath, fell rather than jumped from his boat, then skidded along the grassy bank frantically heaving on his centre line before he realised that he’d left the boat in gear. “This is my first trip!” he explained as I sailed past. Minutes later we turned in to Kings Orchard marina for fuel. It’s a pleasant enough marina with security high on their list of priorities. Each of the pontoons is protected by a locked wire gate and the toilets by locked doors, thwarting boaters like me trying to avoid using my own loo. Eighty litres filled the diesel tank to the brim which means that my average consumption over fifty eight hours use since my last refill was a slightly concerning 1.38 litres per hour. Good news though when the very helpful Irish guy serving us asked if we would like to top up with water and use their Elsan point before we left. Once back on the canal we passed Streethay Wharf sandwiched between the West Coast Main Line and the ever busy A38, along a short stretch a handful of feet away from the whizzing duel carriageway cars and lorries, then a much more tranquil setting at Fradley Junction where we had a bit of an accident. Sally, as usual, was on lock duty. We turned left at the junction and straight in to Fradley Middle Lock. Once through that we entered Shed House Lock. Once the rear gates were closed, in a moment of madness, Sally opened the paddles fully which resulted in the boat being launched into the top gate like an arrow from a bow. The considerable impact instantly snapped the steel top fender loop leaving the fender hanging below the boat’s bow by the two bottom chains. We stopped on the visitor moorings above the lock, removed the fender, assessed the damage, and then set off confidently towards the canal shop at the junction I spotted in my Pearson’s guide. Unfortunately the shop sold art rather than artefacts so we were out of luck. Back on the boat, I searched through my bits’n’pieces box in the engine room. I found a short length of fender chain and some spare shackles so with Sally’s help I was able to “beard” the fender with the spare chain to keep it in place until I could buy a suitable length to do the job properly. With the immediate problem overcome, we treated ourselves to coffee and carrot cake at the Kingfisher Holiday Park’s canal-side cafe back at the junction then, in the spirit of doing as little as humanly possible, sat on a bench in the sun next to our moored boat and read for a couple of hours. Up next morning at the crack of dawn we continued our journey along wooded canal banks, pleasantly devoid of rubbish and clutter. The gardens, without exception, were a credit to the waterside home owners. Even two neighbouring properties, each garden complete with an ancient and rusting JCB, had carefully manicured the lawns around the old machinery. We pulled in to King’s Bromley marina where I invested most of my month’s boat maintenance budget in two metres of eye wateringly expensive stainless steel chain and a handful of shackles. We used their loos then spent a pleasant half an hour wandering around their beautifully landscaped grounds and two fascinating features; a pair of dilapidated lock balance beams and a short rust covered narrowboat with a sentry box like structure towards the rear which must have prevented the boat from passing under bridges, not that passing under bridges was an issue given that the boat was moored on a lawn. Onwards through Handsacre, Armitage and the interesting seven feet wide stretch of canal before Brereton, the roofless “Plumb Pudding” tunnel, still marvelling at the neat and tidy gardens and rubbish free waterway, now roughly following the Trent, we stopped in the centre of Rugeley almost in Tesco’s car park at bridge 66. With a full fridge and empty bins we continued our journey. Sorry Tesco, I dropped four bags of rubbish in the bin by your entrance, but I’m sure you don’t mind. I spend a fortune in your shops. Once out of Rugeley, and in the face of a strengthening wind, we decided to stop for the day at bridge 69 opposite Taft Wharf farm where there’s an operating diesel and coal boat sitting firmly in the mud. After buying a dozen eggs from the farm, squeezed from hens while we waited, we spent a pleasant night on the boat then set off at 8am on the arduous two mile, one lock cruise to the visitor moorings north of bridge seventy two. We wanted to stay close to Cannock Chase for a few days but we had liquid management logistics to consider. We had a full cassette and a nearly empty water tank. There was an Elsan point and water at the junction, so there was no problem emptying one and filling the other but we needed to determine where we could moor later so that we would still be within easy walking distance of Cannock Chase and be able to return easily to the junction again for water and waste disposal. Turning at the junction then returning to our present mooring was no good because if we then wanted to revisit the water point we would need to cruise four hours to Fradley junction before we could turn the boat and head back. Carrying on past the water point and mooring somewhere on the towpath between there and the entrance to Great Haywood marina was an option but with limited mooring opportunities there we thought our best bet would be to reverse off the water point a hundred metres back to the junction, turn on to the Staffordshire and Worcestershire canal and moor half a mile from the junction at Tixall Wide. I had been told quite often that Tixall Wide was a beautiful spot to moor, but hadn’t seen it and didn’t know whether Tixall Wide was actually wide enough to turn my own boat if other boats were moored there. We turned left at the junction towards Tixall Wide and had the pleasure of listening for a couple of minutes to a lady with a face like a bulldog chewing a wasp and an attitude to match. She wasn’t a happy boater. A 70′ boat coming from the north turning onto the Staffs and Worcester canal was immediately caught by the wind and blown into her path. The placid crew on the seventy footer winced, pushed their bow away from one of the dozen Anglo Welsh hire boats moored at right angles to the canal and lowered their heads to avoid the withering stare directed at them as they passed. Fortunately this kind of exchange is the exception rather than the rule. Another fine minutes was all we needed to establish that Tixall Wide, more small lake than canal, offered plenty of room to easily turn the longest narrowboat so twenty minutes later we were back at the boat for the short cruise to the water point and Elsan facility and then to our new spacious mooring. But we had to deal with a wet dog first. 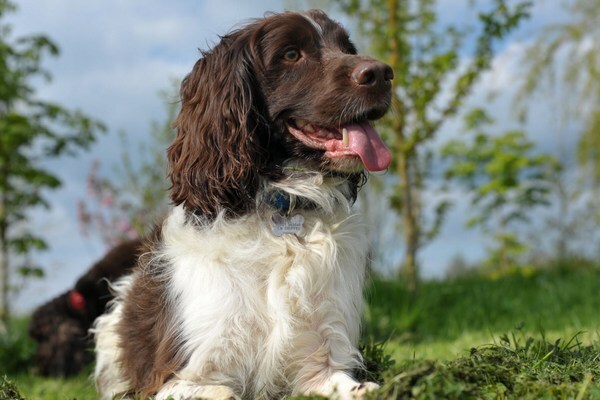 Charlie is a friendly, loving but rather nervous springer spaniel with an annoying habit of barking whenever people or other dogs approach. We’ve tried to break him of the habit but we’ve failed miserably. He doesn’t bark for very long and there’s certainly no malice in his misguided attempts to say hello, but his apparent aggression is embarrassing. Back near the boat we met another boater with a similarly highly strong dog. This one was a collie. I offered my normal greeting of “Don’t worry if he barks, there isn’t an ounce of harm in him”. The collie owner replied in a similar vein, so we left the two dogs to it. Charlie bared his fangs and barked. The collie, not to be outdone, darted forward and snapped half-heartedly at Charlie. Charlie responded, as usual, by running as fast as possible in the opposite direction. Unfortunately for him, the opposite direction on this occasion was straight in to the canal. After Sally towelled Charlie dry, we moved to Tixall Wide then spent the rest of the day pottering. While Sally removed all our gear plus plastic matting from the front deck then hosed and scrubbed it clean, I replaced the chain on our front fender, then spent the rest of the afternoon cleaning the engine room (see below) and tackling some long overdue jobs. Our rear deck has a hatch set in it which allows access to the weed hatch. In the recessed hatch surround is a drainage hole to channel any water falling on the deck through a three feet length of rubber hose running from beneath the hatch through a hole in the side of the boat then into the canal. The hose regularly blocks so I rerouted the hose vertically into the water trap and bilge pump beneath the stern gland. Then I looked at everything I have stored in the engine room and realised how much I appreciate having a traditional stern narrowboat and the dry and secure storage space afforded by the engine room. I appreciated the extra space even more once I took everything out and laid it on the towpath so I could give the engine room a spring clean. I’ve listed everything in there and included a photo below. One of my spring cleaning duties was to remove a little water which has suddenly appeared in the bilge. I haven’t a clue where it’s come from. I know it’s not running back from the cabin bilge. I know it’s not condensation forming on the uninsulated engine room metal, something which I suffer from during the winter months, and I know it’s not rainwater overflowing the blocked drain in the deck above, or water dripping from the stern gland. All I know is that there’s two or three pints of clear liquid in there after even a short cruise. The ingress is driving me mad after months of having a bone dry bilge, but I’m sure I’ll discover the reason eventually. At the moment if I want to remove every drop of water from the engine bilge I have to squeeze into a tight gap between the immovable frame around the engine and the port side of the boat, then bend double under the frame so I can mop up the water with a cloth then wring it out in a bucket. It’s not a comfortable or practical solution. I’ve been looking for a while now for a wet and dry vac powerful enough to do the job and small enough to store in the engine room. Until this week, every machine I found was either too large or had poor customer reviews, but I think I’ve found one which is perfect for the job. This one looks perfect. It’s small enough to fit easily in the engine room, has very good reviews, some from narrowboat owners, and it costs less than £50. I’ll let you know how I get on with it but right now I have to find my bucket and cloth and disappear into the depths of the engine bay again. 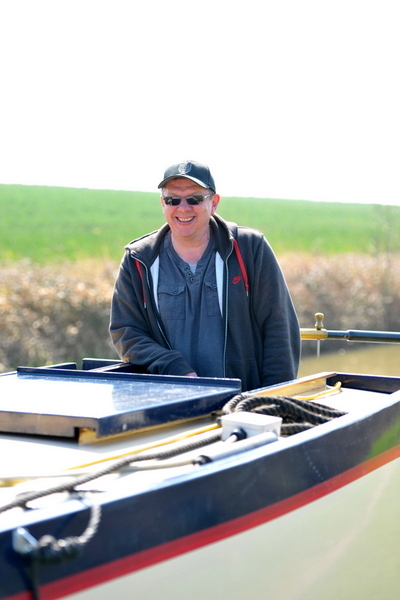 If you haven’t yet decided which narrowboat stern will suit you best, maybe I can help you. There are three narrowboat stern types; traditional, semi traditional and cruiser. A cruiser stern is what you see on the majority of hire boats. The back of the boat has a large open deck area where half a dozen happy holiday boaters can stand in comfort with the helmsman while he or she grips the tiller with a white knuckled fist wondering how on Earth they are going to keep the unwieldy vessel in the middle of such a thin ribbon of water. A boat with a semi traditional stern also has a large rear deck but the cabin sides extend almost to the back of the boat enclosing the deck. Both the cruiser and the semi traditional stern narrowboats enjoy more space for standing in comfort outside while the boat is in motion. The downside is that there is less cabin space within the boat and that the engine bay is often prone to unwanted water ingress via the deck above. The third type is the traditional stern, which is what I have on my boat. A traditional or “trad” stern narrowboat has a limited amount of space for guests to stand with the helmsman but the engine is enclosed within the main cabin. This type of stern is perfect for me. I rarely have more than two guests on the boat. Most of my visitors are out with me for my discovery days. In can accommodate two people in addition to myself on my rear deck in reasonable comfort, providing I use a shorter than normal tiller which doesn’t extend into the cockpit where one of the guests needs to stand. As far as I’m concerned, the advantages of a trad stern far outweigh the disadvantages. There is very little living space on board a narrowboat. With a forty eight feet long cabin I have two hundred and eighty eight square feet to pack all of Sally’s and my own worldly possessions, including thirty square feet in the engine room. You may be tempted to dismiss the additional space in the engine room but, before you do, let me tell you what I have in mine. All of the following are items which I want or need on board but which I don’t particularly want cluttering our living space. There’s a huge amount of stuff in there but, once I paid a fortune to have the engine professionally boxed in and sound proofed, there is room to store everything neatly and out of the way. I took everything out of the engine room and laid it out on the towpath so that I could list it. See what I do for you? Here’s about half of the engine room’s contents. I didn’t remove the things clipped to or hanging from the walls. Kipor suitcase generator – We purchased the generator to allow Sally to use high power mains appliances when off grid. She told me that she couldn’t do without her iron, hair dryer, hair straighteners and vacuum cleaner. We’ve used it briefly on previous cruises but three weeks into this trip and it hasn’t been used once. Sally is still washing her hair just as much but now with so much free time on her hands, she doesn’t feel the need to dry it almost instantly with a hair destroying, power hungry machine. Sally’s also found a labour saving and very effective solution to the ironing problem. She folds everything neatly and stacks the clothing in the cupboards we had fitted in the bathroom when we had the gas water heater removed. Now gravity does the jobs which Sally used to dislike so much. Big pink box – A robust pink plastic box sits next to the generator. I use it to hold several pairs of gloves, a couple of fleece hats, a wide brimmed leather hat I bought for £20 from the Crick Boat Show three years ago, and another made of kangaroo and crocodile skin bought online and shipped at great expense from Australia. I’m sure the pink box and the flamboyant leather hat speak volumes about me, but I’m not sure I like what they say. Paint and equipment – I keep everything in the engine room I need to touch up the boat’s paintwork. There are tins of blue top coat and undercoat and cream for the cabin sides and roof, red Damboline for the engine bay, rear deck and the bow around the engine hatch and varnish for the internal woodwork plus various grades of sandpaper, a scraper and wire brush, paint brushes, rollers and cleaning fluid. I also have a Brushmate for storing paint covered brushes ready for instant use when I need them next. Oil and grease – There’s a 5 litre bottle of engine and gear box oil, WD40 and 3 in 1 oil and two tubs of waterproof grease for the stern gland, a box of nitrile gloves for keeping my hands clean and a roll of blue paper for cleaning up spills. Recovery Gear – I have a recovery magnet slightly smaller than a match box but capable of lifting 50lb and a 100m length of paracord which I tie it to. The para cord is handy for all kinds of different jobs including making a washing line between trees. For any items I want to get out of the water which are too heavy for the magnet, I have a grappling hook. The grappling hook is also handy if the boat gets stuck in the shallows. I can throw the grappling hook, attached to the para cord on to the opposite bank, then pull the boat laterally away from any obstruction. Mooring, steering and locking – I’ve fitted spring clips and sturdy hooks to the bulkhead between the engine room and our bedroom. There are three mooring pins, each capped with a high visibility yellow tennis ball, three mooring chains and two lump hammers plus three windlasses, an anti-vandal key and a BW facilities key and, last but not least a pair of different length tillers and two tiller pins. I have a four feet long tiller which I use when I’m on my own at the back of the boat and a two feet long tiller for when I have guests. The longer tiller with more leverage helps turn my heavy rudder with less strain but the short tiller allows two guests to stand on the back of the boat with me without being swept off the boat. Shore lines – I have two; one twenty metre line for plugging the boat into a shore supply and a five metre line to run from the bank-side suitcase generator to the boat. Tools – Electric drill with screwdriver and drill bits, bolt croppers, wood saw, hacksaw, ratchet spanner set, socket set, adjustable spanners, a tape measure or two, mole grips and a pry bar, all in a tool box stored on a shelf. Torches – I have two; one miner’s style head torch for working on the engine hands free, and another powerful hand held lamp for tunnels. Life jackets – Two gas inflated jackets for river cruising. They’re similar to the ones worn by CRT employees. I’m sure there are one or two items I’ve missed, but you can see how much I have stored in this small but weatherproof and secure space. 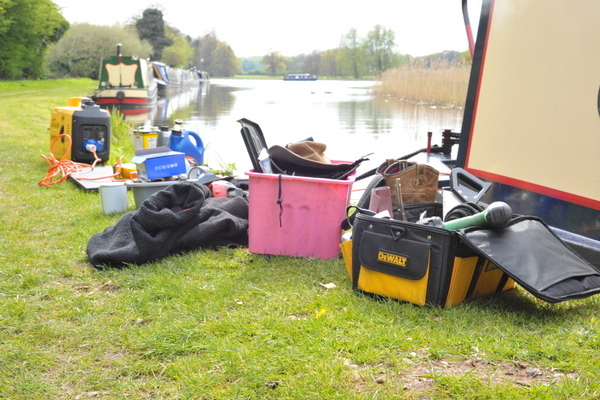 You simply can’t store this amount of equipment securely and out of the elements with a cruiser or semi traditional stern narrowboat. Boats will large open rear decks often have lockers where you can store some of your engine room essentials but they are rarely either weather proof or secure. The lockers are often damp and dirty places. Boat owners often have rear deck covers to protect the area from the elements. These covers don’t do a bad job of keeping the gear on the rear deck dry but the problem is what to do with everything stored there when the cover is removed ready for the boat to me used for cruising. Even if the equipment under the cover is kept dry, it’s certainly not secure, so you wouldn’t want to leave your valuables there when away from the boat. A trad stern narrowboat has one other important advantage over those with cruiser or semi traditional sterns. If you plan to do any engine maintenance yourself, a trad stern boat allows you to work in a warm and weatherproof environment rather than standing in a damp and cold engine bay open to the elements. Some live aboard boat owners decide on a cruiser stern boat because they have additional space for sitting outside. I don’t understand this argument at all. Both Sally and I enjoy sitting outside as much as anyone else but with miles and miles of verdant and mostly well maintained towpath, there’s plenty of room to accommodate the pair of us, our two camp chairs and our folding table. We don’t have a huge number of guests so don’t need acres of outdoor standing space at the back of the boat, but we like a neat and tidy boat and appreciate the additional storage space the engine room gives us. There you go. Mine is an entirely subjective point of view. I’m firmly in favour of traditional stern boats. The style suits Sally and I. Maybe it won’t suit you but at least now you are aware of the pros and cons. “I am still at the investigation and decision stage. I am actively looking for boats and a local marina that accepts liveaboards. I booked your discovery day for some hands on experience and to confirm whether or not a life afloat would be an option for me and boy is it! I really enjoyed the day but can’t believe how fast it went by considering that most of the time we were only doing 1.5 to 2 miles an hour. Your instruction method is more like two mates having a chat rather than teacher/pupil which made the day flow really well and, I believe, made it much easier to absorb everything you were telling me. I probably picked up more knowledge in 10 hours with you than I would have done in 10 months surfing the internet. Overall the structure of the day is great and I would not want to add anything.